Body composition testing is increasing in popularity with advances in science and technology. These tests are quick to perform and can provide in-depth results about muscle mass, body fat mass, body fat percentage, bone density, and more. 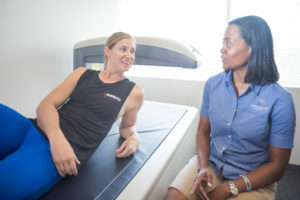 There are a number of different testing methods that are used to determine body composition, including using calipers, bioelectrical impedance, and hydrostatic weighing, also known as the “dunk tank.” However, results from these techniques can be inaccurate. Two of most popular methods in the industry, the Bod Pod and DEXA technology are highly accurate, but differ in several ways. Body composition is the makeup of fat, lean muscle and bone tissue in the body and is an accurate measure of overall health. Certain tests can provide a measure of lean body mass and a body fat given as both a percentage and as total mass. Percent body fat is a good indicator of health, as having too much fat can increase risk of heart disease, diabetes, and a number of other health complications. Body composition is a better indicator of health than total weight because it accounts for the distribution of mass in the body. Assessing body composition not only provides a screenshot of health, but also allows for monitoring over time based on changes to fitness and nutrition plans. For example, an individual with a goal to increase muscle mass or decrease body fat can track progress by taking periodic tests to ensure their changes in diet and exercise are being implemented correctly. Utilizing a highly accurate and reliable testing method is important in measuring baseline body composition and tracking progress. This method uses air displacement plethysmography to calculate body composition. During the test, and individual is required to wear tight-fitting clothing like a bathing suit, compression shorts, and a swimming hat while sitting inside of an air-tight pod. Tight clothing is required so the test does not register extra air displacement which can increase reported fat levels. Over a span of five to eight minutes, air pressure inside the chamber is slightly altered to measure total body volume. It also measures total body weight, density, fat, fat-free mass, lung volume, and how much energy is burned each day at rest. DEXA, which stands for dual energy x-ray absorptiometry, is a method known as the “gold standard” of body composition and body fat testing. Composition ID utilizes this technology for CompID Scans, which is administered by placing an individual on a table on their backs as a small arm slowly passes over the body from head to toe. It emits low-dose x-ray beams, equivalent to eating four bananas, and projects them through the body into the table. The table then measures how many of the rays are absorbed by the body. The entire scan takes less than 10 minutes and no specific clothing limitations are required. The results from a CompID Scan includes several data points that inform health and body composition, including total body mass, percentages of fat and lean body mass, bone mass, and bone health. Not only does this test gives feedback about fat and muscle mass in general, it also provides information on fat and muscle distribution. It gives detailed data on where the majority of fat is located regionally and provides a measurement of visceral fat, a figure that has significant implications of risk for certain diseases. Knowing the specific distribution of fat and lean mass also allows for an assessment the symmetry of mass throughout the body. It provides an opportunity to observe any imbalances in the body that may warrant interventions for addressing issues or prevent future complications from arising. These comparisons can also reveal weak spots or are certain areas of the body that may be impacted by overtraining. One major difference between these two methods is the variables they measure. The air displacement method (Bod Pod) uses a two-compartment model and therefore is only able to measure totals and percentages of fat and non-fat mass. Unlike the CompID Scan, it is not able to measure the distribution of lean mass and fat mass throughout the body, and does not provide information on bone health. Results from a BodPod analysis are based on a series one-size-fits-all calculations, which runs a risk for a higher margin of error. It also only provides an estimate of bone density rather than a full reading. This significantly skews numbers for individuals with weak or fragile bones, like the elderly, or those with denser bones, which is commonly seen in athletes. A CompID Scan using DEXA technology can provide much more relevant and informative results about trends or effectiveness of a diet and workout routine. While other testing methods only provide information on changes in overall mass and proportion of fat-to-lean mass, a CompID Scan can compare changes in mass regionally and assess bone mineral density. What sets these two tests apart most significantly is their level of accuracy. The air displacement method relies heavily on pre-calculated formulas, which can result in severe overestimations of fat in underweight people and severe underestimations for individuals who are overweight. Conversely, CompID Scans provide a more accurate measure of body composition without relying on general equations. With more accurate information, an individual can attain a comprehensive, accurate overview of their body composition. Breakthroughs in body composition analysis have proven to be highly valuable in providing information about the human body and specific health markers, especially with regard to total body fat and its relative percentage. There are a number of different methods measure this information, with two methods being more widely accepted. However, when evaluating both methods, the Bod Pod and CompID Scan, DEXA technology is far superior due to its higher accuracy, more detailed and in-depth results, ability to assess bone health, and more. If you are interested in measuring your own body composition with a CompID scan in Houston or the DC area, give us a call today!